Two beauty pageant winners set a tone for social cohesion as they display cultural fashions in the forefront during their humanitarian missions. Self pride is beneficial for individual self-esteem. In some cultures, showing pride is almost mandatory to illustrate one's love and appreciation for community or a cause. In the world of pageantry, contestants are quite selective over the pageant gown that is worn as it is an anticipated segment of the pageant. Judges and audiences typically expect contestants to wear traditional pageant gowns and wardrobe. 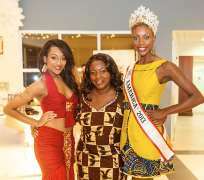 However we found two accomplished women (Ms. Florida America 2013 - Amanda Wamunyima and Ms. America 2013 - Chiniqua Pettaway) who embrace ethnic fashions and display cultural pride in their community. A dynamic new trend is the expression of cultural fashions in the world of mainstream pageantry. Cultural fashions are more prevalent in ethnic-based pageants. Ms. Wamunyima (a first-generation immigrant from the country of Zambia) sparked a trend when she not only wore an ethnic-inspired evening gown but her entire wardrobe during the Ms. America 2013 pageant week's activities comprised of trendy ethnic inspired designs. During the competition, Amanda wore an ivory satin evening gown with metallic gold lace trim and crystals at waist and off shoulder, and side slit. Amanda explains, "My wardrobe is styled by TeKay Designs in Houston Texas. I'm proud of my culture. I want to show my cultural side through ethnic fashions. Because I'm from Zambia, I want to shine a light on African fashions to support the designers. African fashions are more than just clothing; because the garment tells a story in tribal context. For example; the fabric that is used in traditional Musisi dresses often signifies a geographical region and tribal expression. There is also a new generation of Africans who are more inspired by western designs fused with African fabrics. And they call these looks Afrique-Chic. So, I wear ethnic fashions to share more about whom I am." Amanda has sparked a cultural style trend in mainstream pageantry. Since winning her title, you will find Amanda adorned in opulent cultural fashions and representing her title at events while advancing her humanitarian cause. Amanda's mission is to lend her voice to ieEmbrace organization as her humanitarian cause. ieEmbrace provides hospitals and clinics with medical supplies and equipment; as well as offering youth development programs. Presenting culture in the forefront is a stylish asset, even more so at gala events that are as highly profiled as the Golden Icons Academy Movie Awards (GIAMA) ceremony. Amongst the celebrities and socialites, we met with pageant winner Chiniqua Pettaway the reigning Ms. America 2013. Ms. Pettaway's striking appearance in a body sculpting bronze gold lace dress with pleated undertones made her a paparazzi magnet as she arrived to accept interviews. This is intended, because Ms. America knows to leverage media attention to advance her humanitarian mission to the forefront. "I embrace my culture by being active in the African-American community as a mentor to young women. I coach at youth development programs. I teach etiquette classes and lecture young people about life, the importance of education and how it will affect their life in the long term." states Pettaway. As a humanitarian, Chiniqua Pettaway extends her time to support many areas of her community. She extends her time to youth initiatives, social dignitaries, civic groups and spiritual organizations; as well as local entrepreneurial startups. Pettaway is especially passionate about her platform of service "Guard a Heart" a heart health awareness foundation. Guard a Heart's mission is to fight heart disease with their campaign, "Know your Risk, Save a Life." Heart conditions are the number-one killer of men and women in America. Chiniqua Pettaway is a small business owner herself, and her title as Ms. America offers Chiniqua unique opportunities to connect with other businesses and to form meaningful relationships. "I want to wear ethnic fashions that show my cultural pride. TeKay Designs is a young cultural design business and I'm willing to support that platform. The fashions are extremely cohesive as a collection; and you can always identify TeKay's signature design. TeKay's fashions are vibrant in color with diverse styles. The garments are distinctly ethnic, but the looks will compliment anyone. TeKay diversifies the models so when people of different ethnicities see the dresses, they can see themselves wearing TeKay's fashions too. I embrace culture one-hundred percent! And so long as I like the garment, I'll wear it! It's important for me to project a positive image. Popular Media today has a heavy influence on what African-American youth emulate. There are certainly some poor examples being projected in the Media. As I see it, there is a huge gap between where the African-American culture actually has advanced to, and the perception of where we've advanced to. We do not have a lot of good role models for African-American youth to relate to in popular Media so I try to be that positive image and that's why I'm active in the community. I want to have a real presence, and lead by example." explains Pettaway. Ethnic fashions are an asset, and offers a nonverbal expression of pride that automatically signals social status. It is cultural pride that motivates communitarian ways. Historic African-American leaders have always used cultural style to express direction when implementing plans, and to motivate people. Amanda Wamunyima and Chiniqua Pettaway are two of many untold examples of how sister-hood holds up the neighborhood --adorned in cultural style!